Lovebirds make natural lane partners. It’s time to party like it’s 2010, because League of Legends is getting not one but two new champions in one release. The last time something like this happened, we were introduced to Pantheon and Gragas. This new dual champion release is a little more sophisticated. 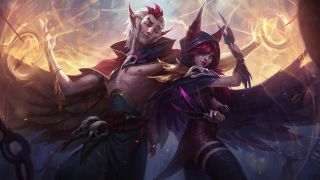 Rakan the Charmer and Xayah the Rebel are two lovers from the new region of Vastaya. They’re an ADC and support combo who have the potential to show up in pro play. They can be selected individually, although there are definite bonuses to rolling with both of them in a lane (they also dance and quip with each other, which is incredibly cute.) Say hello to the two next champions to hit the Rift, and let’s take a look at how their kits are going to fit into the current meta. Xayah’s a standard marksman. She doesn’t have an ammo system, you don’t take her jungle or mid, and she’s all about dealing a lot of damage, very quickly. The big thing that seperates her from the rest of the marksman crew is her Feathers mechanic, which is a Syndra-like way to drop feathers on the field and then cash them in for extra damage. Clean Cuts: Xayah’s passive grants her a mini-Twitch ult after using an ability. Her next three autos pierce all targets and leave a Feather behind. The main target takes full damage and on-hit effects, and anyone in the splash takes half damage. Double Daggers: Xayah throws out two knives that deal a chunk of damage and leave two Feathers. This is her bread and butter poke mechanic, used to set up more elaborate combos. Deadly Plumage: Xayah’s coat rages around her, creating an AOE effect that speeds her up when it strikes an enemy. She also gets a massive attack speed buff, and her basic attacks strike a second time for 20% damage. Here’s what’s interesting—Rakan, her support, also gets Deadly Plumage if he’s in the area. We’ve heard of friends with benefits before, but this is ridiculous! Bladecaller: This is where Xayah cashes in her Feathers. She calls them towards her, and deals a damage to enemies they pass through. If anyone gets hit with three feathers, they’re rooted. This does half damage to minions, so she can’t devastate a wave for splitpush purposes. Featherstorm: Xayah flies into the air and can move around. She is untargetable during this effect. She then rains down daggers in a line, similar to Quinn’s ult, and leaves a line of Feathers behind. If you’ve been yearning for a simple, back to basics ADC, Xayah is the character for you. She loves it when fights drag on so she can set up her Feathers, she dishes out damage, and she has an escape via her ult. The obvious weakness is once she’s in, she only has one real escape tool. Here’s where her support comes in. Rakan is the first support we’ve gotten since Tahm Kench, and he’s equipped to help Xayah (and any other ADC he’s teamed up with) out of sticky situations. Fey Feathers: Rakan will occasionally get a shield that scales with AP. Attacking champions shortens the cooldown. The shield starts with a 40 second cooldown, but winds up at 16 seconds as the game progresses. Gleaming Quill: Rakan has a heal, but it’s gated—he throws out a skillshot that does damage. If it hits a target (minions don’t count), Rakan heals, and then heals nearby allies after three seconds. You can activate it a little quicker by touching an ally. Grand Entrance: Rakan isn’t just a healbot, though. Grand Entrance allows him to dash into the enemies, do some damage, and then knock them up around him. Battle Dance: If he wants to get out after a Grand Entrance, Battle Dance lets him dash to an ally, shielding them in the process. He can re-cast Battle Dance at no cost, as long as he does so within five seconds. Battle Dance has a higher range if he casts it on Xayah. He just can’t wait to see her again! The Quickness: This is the showstopper ability in Rakan’s kit. He gets a movement speed boost and unlocks a passive that means when he touches enemies, he charms them and does damage. He can hit all five enemies, but only once, and the first unlucky champion in his sights grants him an even bigger speed boost to zip around and lock everyone down. First of all, it’s genuinely cool to see these archetypes in the League. I’ve written before about how League has always been a kind of sterile game when it comes to love, and here we have two literal lovebirds who make out, dance together, and have some real passion going on. Rakan may also be the first deliberately hot dude in League, which is a milestone. Sure, Taric is sculpted, but it’s in kind of an artistic way. Every other hot dude (Graves, Yasuo), seems to have been attractive by accident. Rakan? Rakan was built from the ground up to be a masculine, intriguing, charming man. It’s new ground, and it’s a breath of fresh air in our roster of 130+. One thing that must have been a leap forward in League tech is the synced recall. It’s one of those things that is flashy, but doesn’t look that complicated... until you consider that so far, the closest thing we have is the PROJECT skins looking cool if you run them side by side. Here’s how it works: if one half of the duo begins to recall, and the other one runs up to them, they begin an elaborate dance together before heading back to base. That’s cool, and it’s one of those things that speaks to technical groundwork being laid to allow for better champion interactions and relationships. Finally, Rakan and Xayah are a really excellent take on the concept of a dual champion. Sure, there’s Cho’Gall from Heroes of the Storm, but Cho hasn’t really proven to be accessible (and he may have driven my husband and I to the brink of divorce). Xayah and Rakan work well together, have unique, built-in synergy, and can even take advantage of their shared recall for some speedy escapes.